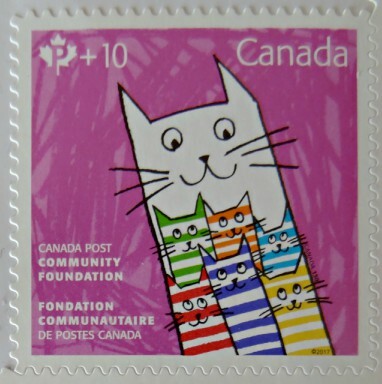 the extra 10¢ above the .85¢ domestic rate from these whimsical cats goes to support the Canada Post Community Foundation which supports community projects for children. 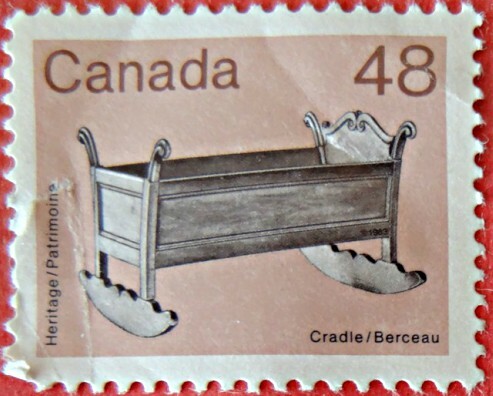 although none of these children slept in an 18th century cradle like this one, maybe their great, great, grandparents did. ...and here I thought that our postal rates were high! The domestic rate in Spain is 0,55€ (.87¢). If you consider the size of the country... ours is pretty insanely high! I can see where your mind was going with cat and cradle. I remember when cat's cradle was quite a craze at school, I'm going back a long number of years here. I love the cheerful cats. 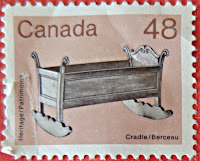 The cradle is a great find for "C"! 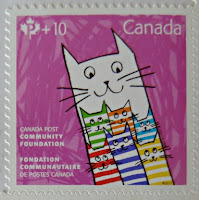 Cool that they are able to raise money through the cute stamps.